, Brat DJ, Verhaak RG, Aldape KD, Yung WK, Salama SR, Cooper LA, Rheinbay E, Miller CR, Vitucci M, Morozova O, Robertson AG, Noushmehr H, Laird PW, Cherniack AD, Akbani R, Huse JT, Ciriello G, Poisson LM, Barnholtz-Sloan JS, Berger MS, Brennan C, Colen RR, Colman H, Flanders AE, Giannini C, Grifford M, Iavarone A, Jain R, Joseph I, Kim J, Kasaian K, Mikkelsen T, Murray BA, O’Neill BP, Pachter L, Parsons DW, Sougnez C, Sulman EP, Vandenberg SR, Van Meir EG, von Deimling A, Zhang H, Crain D, Lau K, Mallery D, Morris S, Paulauskis J, Penny R, Shelton T, Sherman M, Yena P, Black A, Bowen J, Dicostanzo K, Gastier-Foster J, Leraas KM, Lichtenberg TM, Pierson CR, Ramirez NC, Taylor C, Weaver S, Wise L, Zmuda E, Davidsen T, Demchok JA, Eley G, Ferguson ML, Hutter CM, Mills Shaw KR, Ozenberger BA, Sheth M, Sofia HJ, Tarnuzzer R, Wang Z, Yang L, Zenklusen JC, Ayala B, Baboud J, Chudamani S, Jensen MA, Liu J, Pihl T, Raman R, Wan Y, Wu Y, Ally A, Auman JT, Balasundaram M, Balu S, Baylin SB, Beroukhim R, Bootwalla MS, Bowlby R, Bristow CA, Brooks D, Butterfield Y, Carlsen R, Carter S, Chin L, Chu A, Chuah E, Cibulskis K, Clarke A, Coetzee SG, Dhalla N, Fennell T, Fisher S, Gabriel S, Getz G, Gibbs R, Guin R, Hadjipanayis A, Hayes DN, Hinoue T, Hoadley K, Holt RA, Hoyle AP, Jefferys SR, Jones S, Jones CD, Kucherlapati R, Lai PH, Lander E, Lee S, Lichtenstein L, Ma Y, Maglinte DT, Mahadeshwar HS, Marra MA, Mayo M, Meng S, Meyerson ML, Mieczkowski PA, Moore RA, Mose LE, Mungall AJ, Pantazi A, Parfenov M, Park PJ, Parker JS, Perou CM, Protopopov A, Ren X, Roach J, Sabedot TS, Schein J, Schumacher SE, Seidman JG, Seth S, Shen H, Simons JV, Sipahimalani P, Soloway MG, Song X, Sun H, Tabak B, Tam A, Tan D, Tang J, Thiessen N, Triche T, Van Den Berg DJ, Veluvolu U, Waring S, Weisenberger DJ, Wilkerson MD, Wong T, Wu J, Xi L, Xu AW, Yang L, Zack TI, Zhang J, Aksoy BA, Arachchi H, Benz C, Bernard B, Carlin D, Cho J, DiCara D, Frazer S, Fuller GN, Gao J, Gehlenborg N, Haussler D, Heiman DI, Iype L, Jacobsen A, Ju Z, Katzman S, Kim H, Knijnenburg T, Kreisberg RB, Lawrence MS, Lee W, Leinonen K, Lin P, Ling S, Liu W, Liu Y, Liu Y, Lu Y, Mills G, Ng S, Noble MS, Paull E, Rao A, Reynolds S, Saksena G, Sanborn Z, Sander C, Schultz N, Senbabaoglu Y, Shen R, Shmulevich I, Sinha R, Stuart J, Sumer SO, Sun Y, Tasman N, Taylor BS, Voet D, Weinhold N, Weinstein JN, Yang D, Yoshihara K, Zheng S, Zhang W, Zou L, Abel T, Sadeghi S, Cohen ML, Eschbacher J, Hattab EM, Raghunathan A, Schniederjan MJ, Aziz D, Barnett G, Barrett W, Bigner DD, Boice L, Brewer C, Calatozzolo C, Campos B, Carlotti CG, Chan TA, Cuppini L, Curley E, Cuzzubbo S, Devine K, DiMeco F, Duell R, Elder JB, Fehrenbach A, Finocchiaro G, Friedman W, Fulop J, Gardner J, Hermes B, Herold-Mende C, Jungk C, Kendler A, Lehman NL, Lipp E, Liu O, Mandt R, McGraw M, Mclendon R, McPherson C, Neder L, Nguyen P, Noss A, Nunziata R, Ostrom QT, Palmer C, Perin A, Pollo B, Potapov A, Potapova O, Rathmell WK, Rotin D, Scarpace L, Schilero C, Senecal K, Shimmel K, Shurkhay V, Sifri S, Singh R, Sloan AE, Smolenski K, Staugaitis SM, Steele R, Thorne L, Tirapelli DP, Unterberg A, Vallurupalli M, Wang Y, Warnick R, Williams F, Wolinsky Y, Bell S, Rosenberg M, Stewart C, Huang F, Grimsby JL, Radenbaugh AJ, Zhang J,. 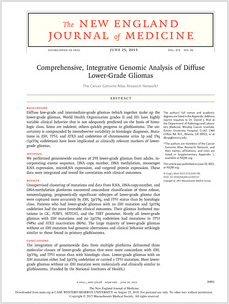 Diffuse low-grade and intermediate-grade gliomas (which together make up the lower-grade gliomas, World Health Organization grades II and III) have highly variable clinical behavior that is not adequately predicted on the basis of histologic class. Some are indolent; others quickly progress to glioblastoma. The uncertainty is compounded by interobserver variability in histologic diagnosis. Mutations in IDH, TP53, and ATRX and codeletion of chromosome arms 1p and 19q (1p/19q codeletion) have been implicated as clinically relevant markers of lower-grade gliomas.We performed genomewide analyses of 293 lower-grade gliomas from adults, incorporating exome sequence, DNA copy number, DNA methylation, messenger RNA expression, microRNA expression, and targeted protein expression. These data were integrated and tested for correlation with clinical outcomes.Unsupervised clustering of mutations and data from RNA, DNA-copy-number, and DNA-methylation platforms uncovered concordant classification of three robust, nonoverlapping, prognostically significant subtypes of lower-grade glioma that were captured more accurately by IDH, 1p/19q, and TP53 status than by histologic class. Patients who had lower-grade gliomas with an IDH mutation and 1p/19q codeletion had the most favorable clinical outcomes. Their gliomas harbored mutations in CIC, FUBP1, NOTCH1, and the TERT promoter. Nearly all lower-grade gliomas with IDH mutations and no 1p/19q codeletion had mutations in TP53 (94%) and ATRX inactivation (86%). 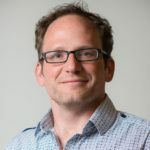 The large majority of lower-grade gliomas without an IDH mutation had genomic aberrations and clinical behavior strikingly similar to those found in primary glioblastoma.The integration of genomewide data from multiple platforms delineated three molecular classes of lower-grade gliomas that were more concordant with IDH, 1p/19q, and TP53 status than with histologic class. Lower-grade gliomas with an IDH mutation either had 1p/19q codeletion or carried a TP53 mutation. Most lower-grade gliomas without an IDH mutation were molecularly and clinically similar to glioblastoma. (Funded by the National Institutes of Health.). Posted in Jill Barnholtz-Sloan, Publications and tagged Adolescent, Adult, Aged, Chromosomes, Human, Pair 1, Chromosomes, Human, Pair 19, Cluster Analysis, DNA, Neoplasm, Female, Genes, p53, Glioblastoma, Glioma, Humans, Kaplan-Meier Estimate, Male, Middle Aged, Mutation, Neoplasm Grading, Proportional Hazards Models, Sequence Analysis, DNA, Signal Transduction.